A decade after Mark Millar and Steve McNiven’s Civil War became the biggest Marvel event of the 2000’s, Marvel’s throwing hero against hero again for Civil War 2. Please note that all of the trade and comics reading orders below have been updated weekly, as new comics were released! Dave’s Note: For those following along in real-time, new comics will be added in bold, italicized font (like so) the week of their release. Same goes for any changes made that week. If you want to really be caught up, I recommend 1) Secret Wars and 2) Invincible Iron Man: Reboot , which collects the first 5 issues of the run and explains all the Doctor Doom elements you’ll see in the Invincible Iron Man issues. Civil War #0 also very casually references outcomes from Infinity and Inhumanity, so now would be a very reasonable time to check out more Marvel NOW! comics. This reading order will continue to be updated as new comics are released, and as I read them to determine placement. It is highly recommended you read the first 6 issues of Ultimates prior to Ultimates #7. For starters, it’s one of Marvel’s best cosmic superteams in years, and Al Ewing and Kenneth Rocafort are crafting one of the absolute best post-Secret Wars comics. Perhaps more importantly for Civil War II, issue #7 isn’t going to make much sense without the background of Carol’s vision. You can grab the first collection of Ultimates #1 to #6. This is just a simple preview for the tie-ins that will be taking place during Civil War. It’s a free previews magazine, and not essential reading for the story. This issue was published after Civil War II #2, but after one issue I think it’s going to fit best shortly after Civil War II #0. Highly recommend this Infinite series for 1) Karnak and 2) some interesting uses of the digital Infinite format. “All buckets are essentially the same bucket.” Infinite series from Al Ewing continues to excel. Great issue as usual from the Ms. Marvel team. If you’ve never read Ms. Marvel, this is as good a time as any to check out one of Marvel’s best new character creations of the 2010’s . Civil War II #1 – Note the super ultra tight continuity note below FCBD Civil War II below! 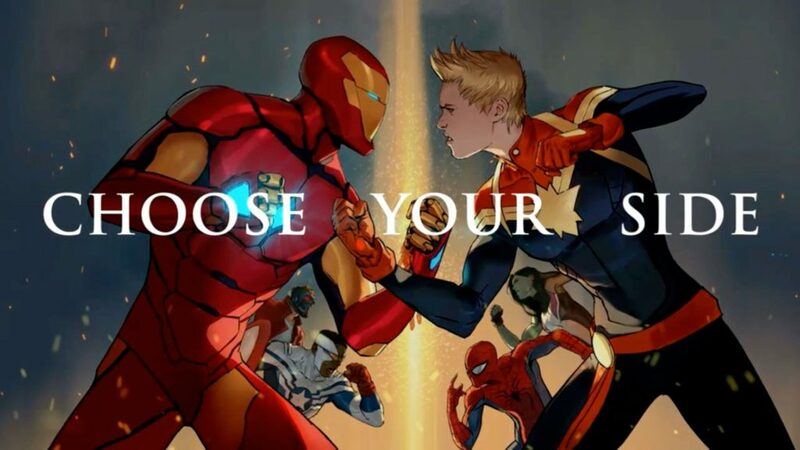 If you want to get REAL tight with your continuity, Captain Marvel #6 and the FCBD Civil War issues both occur about 3/4 of the way through Civil War II #1. Read Captain Marvel #6 and FCBD Civil War II after Ulysses suggests the Inhumans contact the Ultimates – then go back to Civil War II #1 to finish! Technically, you could stop Civil War II #1 at the 3/4 mark noted above, read Gods of War #1 and New Avengers #12, then read FCBD Civil War II, and then finish Civil War II #1. But that’s a lot of continuity work for not a lot of payoff, so I recommend you just read them after, aware that the majority of each issue occurs during Civil War II #1! Very loose tie-in, that simply will not make sense if you haven’t read Avengers Standoff and Captain America: Steve Rogers Vol. 1 . Don’t bother with Deadpool #16 if you want comics actually tied in to Civil War II. Don’t bother with Deadpool #17 if you want comics actually tied in to Civil War II. This is the loosest of possible Civil War II tie-ins. Unless you’ve been reading International Iron Man (and it’s Bendis and Maleev, so there’s ample reason) I see no good reason to include this issue as part of Civil War II. By the time International Iron Man #5 rolls around were completely removed from Civil War II, so I’d advise against including. Important tie-in explaining the state of the Hulk if you haven’t been reading The Totally Awesome Hulk. Very strong first issue! Wilson Fisk is back in town. Goodness H. Gracious the “Civil War II” title on this is misleading. Just a Hercules story from Dan Abnett and co.! You absolutely do not need this comic. I haven’t felt buyer’s remorse like this since I picked up Weezer’s “Make Believe” at Best Buy the day it came out. Very loosely tied to Civil War II, and will not make very much sense if you haven’t been following All-New All-Different Squadron Supreme from the beginning! Ultimates #10 and #11 actually take place during Civil War II #4, in between panels starting on page 12. Your best bet is to simply read them together after Civil War II #4. Also, if it can’t be Jim Starlin every time, I’d like to nominate Kenneth Rocafort for all-time Thanos artist. As observed by Troy in the comments below, Hulk #9 likely occurs during Civil War II #4, as opposed to strictly after the issue’s conclusion. I’d still read here in one larger chunk. 2099 falls under the “barely a tie-in” category, unfortunately. This is your friendly reminder that Deadpool has Bodiddly to do with Civil War II. At the time of release (10.5), we really can’t say how far in advance the final issue in Bendis and Deodato’s Invincible Iron Man is meant to foreshadow. The cliffhanger ending is well executed enough, though, that you can plausibly read the issue here, essentially as it was published, and just know that something big is coming. This arc of Nick Spencer’s Steve Rogers will be included in Marvel NOW 2.0, but this issue in particular is a directly connected epilogue with Civil War II: The Oath. That’s it for now, I still have one in mind but I have to be sure in which Civil War Issue the fact is released ( I think it is #4) and then I can propose changes! Order updated per this quality feedback. Thank you! Will there be any other updates to this list? Or is it safe to say it’s complete? Barring any feedback, it’s complete. hi I was just wondering which way you meant it when you said ‘Unless you’ve been reading International Iron Man (and it’s Bendis and Maleev, so there’s ample reason’. Highlight on ‘there’s ample reason’. I was just wondering whether you meant theres ample reason to be getting it or ample reason to not be getting it? Thank you Dave for ALL you do!!! You make catching up on Marvels a lot easier. I’ve been using your reviews, lists and suggestions for the past 3 years or so while trying to make up for nearly 40 years away from Marvel. Between you and Wiki and Marvel itself, it been a fun mostly-mapped journey … with fun sidetrack adventures! One question on Civil War II: Is it OK to read the graphic novels in the list/order you give, or better to go from the story-by-story list? Or wait three to six months from now and tackle it all then? There’s so many options on things I can/want to do: I still haven’t read the House of M series; just wrapping up all the Infernos, and think I need more Uncanny X-men before tackling Wanda’s Biggest Moment. These lists are very handy indeed. Dave – Would it be possible to maybe include an excel file of the lists for download? Would serve as an awesome checklist when collecting the multiple books in the storyline. These order lists are usually put together very well. This time around, though… We get how a dude’s power works before anyone scans him. A huge death before the character actually dies. One of the younger heroes working with one side AFTER they’d said they were done with it. A huge battle on the news before it breaks out. I guess I’m lucky that I think the whole event has been pretty bad. Because there are more, and some of these misfiles are kind of a big deal. Are you talking about errors in the event itself or in this particular reading order ? Yeah! Eff that guy! Probably just read Totally Awesome Hulk 9 out of order like a jackass. BOOO! Let’s throw snakes! I don’t even care that Hawkeye being acquitted is at the end of Mockingbird 8, that was OBVIOUS and reading the one issue out of order would be stupid just for that! Frankly, I’d blame Marvel for all that Ulysses’s-powers-are-just-a-stupid-percentage-based-thing-missorder. Just another case of some stupid little topic getting spread around a constantly mismatched and tardy release schedule. That first poster is a JERK! Whoever THAT guy even is… Keep up the good work guys! Bro,Is the last issue in the order supposed to be New Avengers #18 or Uncanny Avengers #18? The final event issue has been added to the Civil War 2 reading order, and I’ve processed all the feedback here and applied as necessary. Thanks to everyone who offered suggestions and help! Civil War 2 is finished! So, mid-June should see the last of this available on Marvel Unlimited, by my reckoning? And then… we’ll have to wait until 25 JANUARY for the Civil War II: The Oath release! So when will this event be complete? End of the year? Because I’m eager to read it, I just want to read it in the best order possible. Civil War II is as good as done. The final issue, Civil War II #9, is released December 28. The tie-ins are also just a small number anymore. I think it’ll be over when we hit 2017. It does seem so that the first comic after Civil War II is Uncanny Avengers, as #15 has a “Civil War II Aftermath” stamp. Also, Inhumans vs. X-Men is getting started in earnest halfway into December, so as that is the next Marvel event, Civil War II should be done within weeks. Contest of Champions #9 was just released on Unlimited and it has a Civil War cover, but I don’t see it on your list anywhere. Should it be in there somewhere? Yes it has a “Civil War” on the Cover but I think it is no Tie-In for this event (which is Civil War [b]II[/b]). It is rather a Tie-In to the first Civil-War, because the Cover has the same style-art as the Tie-Ins from that Event.